Or is its influence found only among the far right extremist groups and lone wolves? 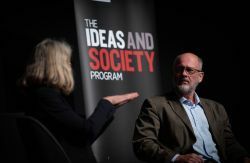 In 2019 La Trobe University’s Ideas and Society Program, convened by Professor Robert Manne, is holding a series of debates on some of the most significant and contentious questions contemporary Australia faces. We are holding this event in association with La Trobe Asia, directed by Associate Professor Euan Graham. Almost no question is of greater significance for Australia’s future than the emergence of China as an economic and military great power. Does the rise of China pose a threat to the security of Australia? If so, a threat of what kind? The two most important voices in this debate are Hugh White and Clive Hamilton. Join a conversation between three of this country’s most perceptive and respected social justice advocates and activists—Cassandra Goldie CEO of the Australian Council of Social Services, Frank Brennan CEO of Catholic Social Services Australia and Cornelia (Conny) Lenneberg, Executive Director of Brotherhood of St Laurence. The event will also feature a welcome address from La Trobe's Vice Chancellor, Professor John Dewar. Our world faces a crisis perhaps greater than any humankind has previously faced—climate change. Unless nations take emergency action in the immediate future, the climate scientists have warned that the kind of Earth on which humans and other species have flourished over several millennia will be lost—forever. Both The Honorable Kevin Rudd and Terry Moran AC are unusually thoughtful and reflective political thinkers who once held offices of greatest responsibility—Rudd as Prime Minister of Australia and Moran as the public servant Rudd chose as Secretary of the Prime Minister’s Department. You are invited to join them at La Trobe’s Ideas & Society Program on what is certain to be a fascinating and illuminating conversation about the governance of Australia. Professor Kerri-Lee Krause will facilitate this event. Join Noel Pearson and Megan Davis for a conversation that will help determine Australia’s future—the relations between its Indigenous and non-Indigenous peoples. 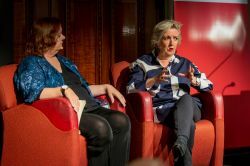 Gillian Triggs and Julian Burnside came together for a fascinating conversation of national importance as they considered how the regime of human rights in Australia can best be defended and extended.